is swimming in mystery and intrigue. "ALL THAT GLITTERS IS NOT GOULD" read the American swim team t-shirts at the 1972 Olympics, aimed squarely at the broad shoulders of 15-year-old swimming phenom SHANE GOULD. The teenage Aussie swimmer was hot favourite for a haul of Olympic medals at Munich - being the world record holder of all the freestyle events from 100m to 1500m. While Mark Spitz was winning a record seven gold medals in the men's events, Shane achieved what no other female Australian swimmer (including the legendary Dawn Fraser) had done, and won three individual golds in the 200m & 400m freestyle and 200m medley. She added a silver in the 800m and a bronze in the 100m. Not quite matching Spitz's historic haul but an amazing feat for such a young swimmer under such intense pressure. In fact, Shane faced so much pressure, that she retired from competitive swimming the following year - aged 16! Fast forward 42 years!! And in Swimming Memorabilia parlance: "Time does ButterFly". In 2014, I (whose swimming exploits were limited to my school days in Malawi & SE London; and included earning the ubiquitous Bronze, Silver and Gold Life-Saving Awards) stumbled across a long lost treasure in a Hammersmith charity shop. For less than the price of a pair of Speedos, I bought Shane Gould's 1999 autobiography "Tumble Turns." I was in a hurry and saw that Shane had signed the book ... along with some other not immediately identifiable signatures. It was not until later when I had the chance to look more closely at the book and five autographs that I realised I had something rather special. 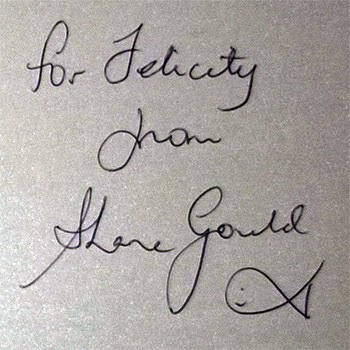 Further research revealed that as well as Shane Gould's main autograph (with a trademark fish doodle), there were signatures and dedications from four other world class swimmers. Nicole Stevenson [Livingstone] - 3 x Olympic medallist in 1992 & 1996. Like Shane, all three were Australian female Olympic swimmers but the fifth & final autograph really took some working out - and it was well worth it! 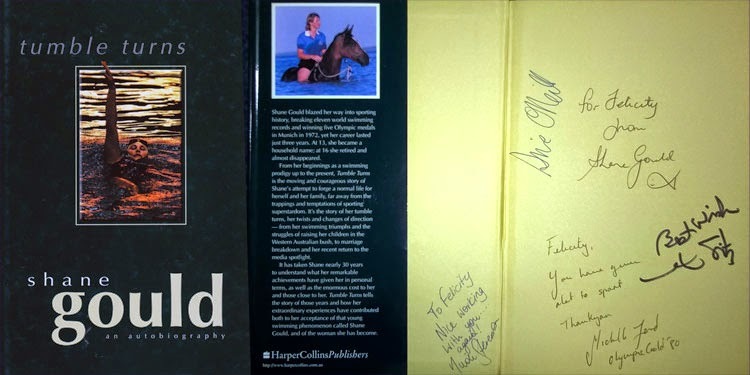 With a simple "Best Wishes" dedication Mark Spitz, no less, had also signed Shane's autobiography. And today, 4th September marks the anniversary of Spitz winning his, then, record seventh gold medal in one Olympic Games in 1972. But who had this glittering array of athletes - with a combined 15 Olympic gold medals to their name - signed and dedicated the book to? 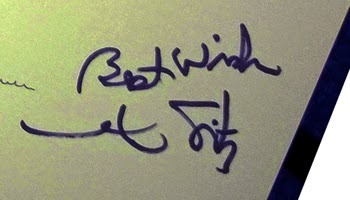 Shane simply wrote "For Felicity"; Michelle added "Felicity, you have given a lot to sport. Thank you", and Nicole also added "To Felicity, Nice working with you again!" I still have yet to identify who Felicity is - but she sounds like a swim coach, perhaps? And I have yet to find out how / why her personalised copy of Shane's autobiography turned up in Hammersmith some 15 years after five world class swimmers dedicated it to her. If anyone has answers to these mysteries or has any other comments about the book, autographs and dedications (or, in this case, Felicitations) I would love to hear from you in the comments section below.